The Vancouver Condo Buzz » GRAND OPENING! Phase 2 River District Vancouver SHORELINE EAST Riverside Condos Now Previewing > 2 Bedrooms along River District Waterfront from $399,900 by Polygon! « From $183,900! Launch at PARK AVENUE Surrey City Centre Condo Towers by Concord! 250 Premium Resort Style Surrey Park Avenue Apartments Priced Under $250k! Club PA Amenities and Great Location! GRAND OPENING! Phase 2 River District Vancouver SHORELINE EAST Riverside Condos Now Previewing > 2 Bedrooms along River District Waterfront from $399,900 by Polygon! Phase 2 at Shoreline River District is now previewing! Riverside condo living in Vancouver is now here! 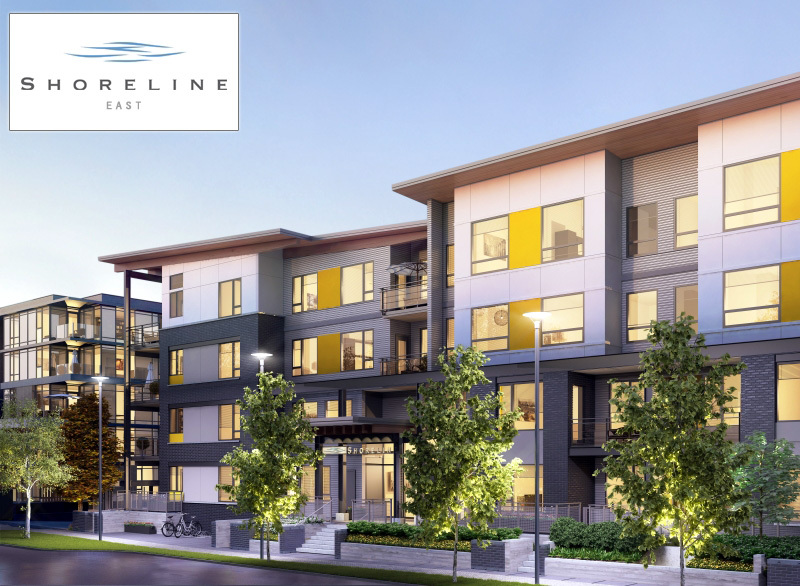 Introducing Shoreline East Condos in Vancouver River District by Polygon Homes (our favourite master builder) which brings a rare collection of riverside waterfront apartment residences to this master planned Polygon community in South Vancouver real estate district. The Vancouver Shoreline East condos will be situated along the sunny banks of the Fraser River and it is ideally located just minutes away from downtown Vancouver, Metrotown in Burnaby and Richmond/YVR. From new parks to new restaurants, new schools and an impressive town centre, be a part of this transformation at South Vancouver’s River District Shoreline East condo community. Two bedroom Shoreline East condos start from just $399,900, making them the most affordable riverside condo development in Vancouver! The presentation centre is launching River District Phase II right now, so make sure you visit them at 8688 Kerr Street Vancouver for more information, features lists and floor plans. Phase 2 at River District is located at 3162 Riverwalk Avenue and 3168 Riverwalk Avenue Vancouver South. Visit www.polyhomes.com for more information and to pre-register your interest! Phase 2 at River District Shoreline East condos introduces concrete homes that feature modern West Coast architecture with distinctive elements that include the use of heavy timbers and steel beams, board formed concrete with glass railings and metal accents and brick cladding for a truly contemporary look and feel. The distinctive Shoreline East River District condo entry plaques personalize each private residence and there will be an impressive modern entry door to the lobby featuring elements of natural stone and wood, giving Shoreline East an identity and presence all its own. The street front presales Vancouver Shoreline East condos at River District boast articulated entry features with brick and metal detailing. Phase 2 will also feature a well lit underground parkade with security cameras and emergency buttons for added security. There are enterphones outside the main entrance lobby with security and key fob access to the common areas as well as to the parkade. All homes at Shoreline East Vancouver condos will come with the comprehensive Travelers Guarantee Company of Canada home warranty (2-5-10 years) and there are sprinklers and heavy dead bolt locks and door viewers for each suite entry door. All ground level homes will have pre-installed security alarm systems. There are optional secured storage for select homes. The on-site amenities at River District Phase 2 Shoreline East apartments include a fully equipped fitness gym as well as a resident’s lounge that has a bar serving area and full kitchen. There is also a centrally located courtyard area with children’s play area, seating areas and garden plots. In addition, the Phase 2 River District condos at Shoreline East will be environmentally friendly. Featuring LEED Rating GOLD standards throughout the building process and design, the Shoreline East Vancouver condos will introduce low VOC water based paints with at least 20% recycled contents, Energy Star rated appliances wherever applicable, low E double glazed thermally broken windows in addition to a hydronic baseboard water based heating system. Other LEED Rating GOLD standards at the presales Vancouver Shoreline East apartments include CRI Green Lable carpeting, laminate floor underlay that is made from 100% recycled materials with less than 18 ppm formaldehyde in addition to R40 – batt insulation that contains at least 40% recycled materials. Other environmentally sensitive building standards include Gypsum Wall Board, builti n roll out recycling bins in every home and hot water/heat supplied by the local District Energy Utility. Of these home features lead to a healthier and happier lifestyle at the riverside Vancouver Shoreline East apartments at River District community by Polygon. Please note that the features are subject to change at any time. Please speak with a River District sales representative for more information. The distinguished interior specifications include such things as rich wood style laminate floors in living/dinning rooms as well as carpets in the bedrooms. 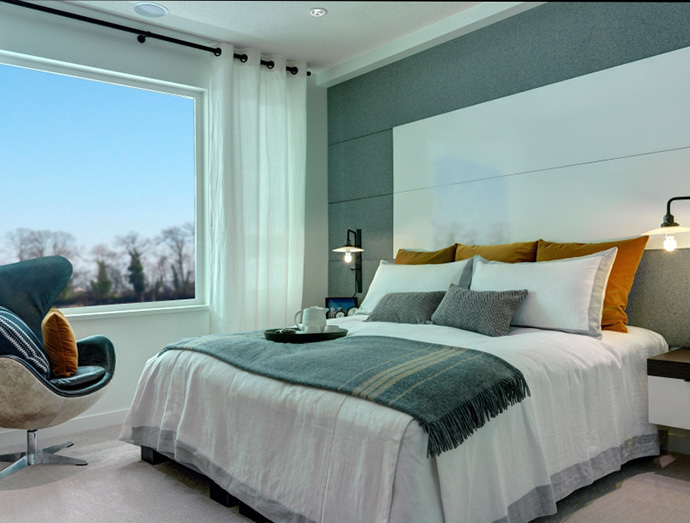 The River District Phase 2 riverside apartments for sale will have over height 9 foot ceilings in the living rooms and two designer colour schemes for you to choose from (Cielo and Terra). All homes have vertical blinds on sliding doors and horizontal blinds on windows. All River District Phase 2 riverside apartments have outdoor living space as well! The homes have conveniently located TV outlets and telephone jacks in main living area and master bedrooms in addition to a full capacity stacked washer and dryer. 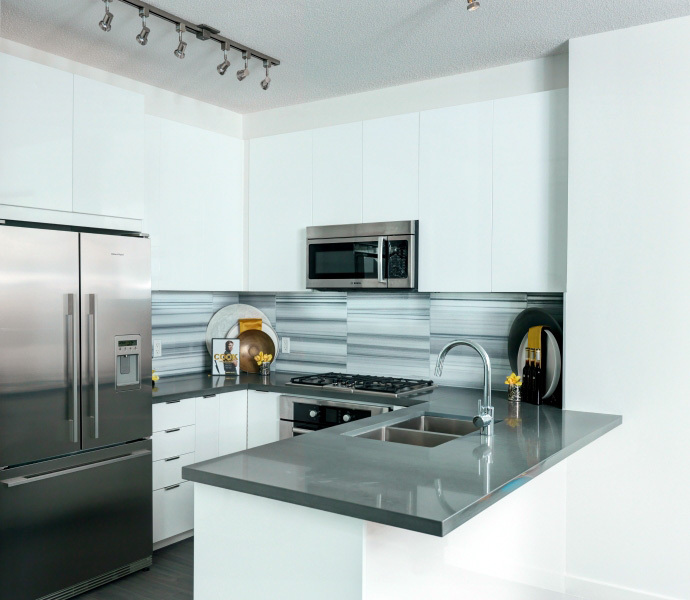 The gourmet kitchens at Phase 2 Shoreline East Vancouver riverside apartments introduce premium quartz countertops and stone backsplashes in addition to custom, premium square edge cabinetry with polished chrome hardware. Other kitchen features include roll out recycling bin stations and a premium stainless steel Energy Star rated appliance set by Bosch and Fisher & Paykel (very high-end) All kitchens have under mount double stainless steel sinks by Sonetto in addition to polished chrome faucet by Grohe. The Shoreline Phase 2 riverside apartments in Vancouver South real estate district also features contemporary halogen track lights, soft close hardware and special pantry and lazy susan storage as per floor plan. The spa inspired bathrooms at the presales Vancouver Shoreline East at River District Phase 2 apartments includes an ensuite bathroom with sleek marble counter tops, contemporary soaker tub with ceramic tiled shower and tub surrounds as per plan in addition to floating flat paneled cabinets with soft close polished chrome hardware and under cabinet lighting. Also, the presales Vancouver Shoreline East at River District Phase 2 apartments will feature designer selected imported porcelain tiled floors, polished chrome tub and shower faucets by Grohe and rectangular under mounted sink and polished levers by Grohe. 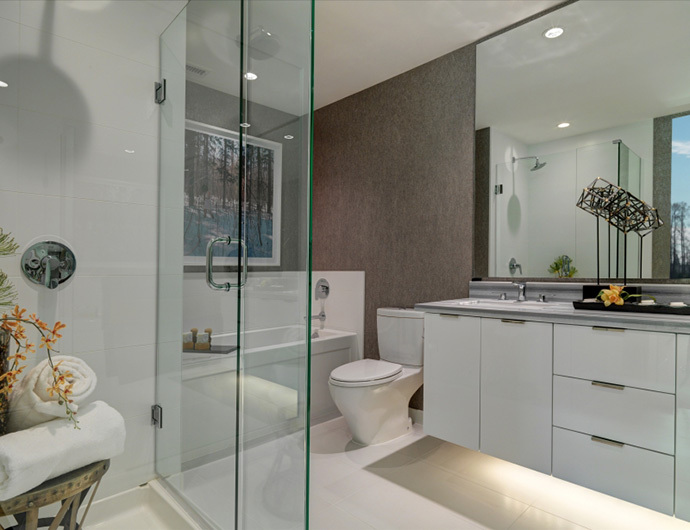 Other bathroom features include Toto dual flush water closets with soft close lids and vanity mirror with contemporary lighting. 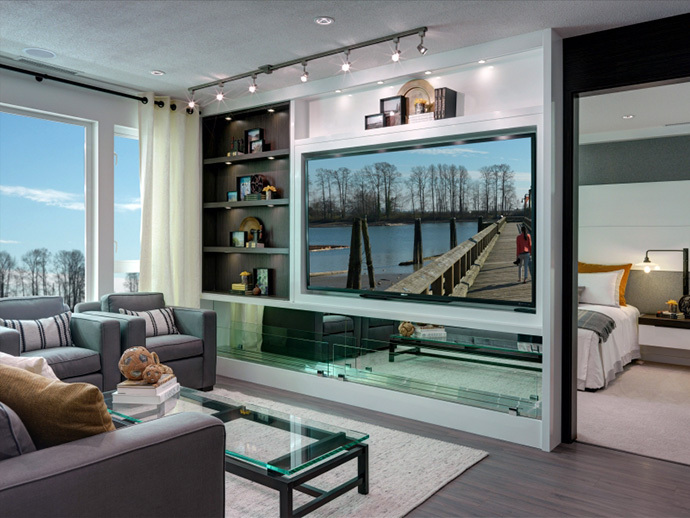 Shoreline is a long-awaited series of truly waterfront homes in South Vancouver. Boasting West Coast modern architecture featuring brick and concrete facades on the exteriors, and refreshing open-plan layouts inside for great views, you will discover a new standard for stylish living. Being a member of the master planned community of River District Vancouver also adds unparalleled privileges as the list of future amenities such as new schools, parks and shopping grows impressively.